We are proud to be hosting a meeting of the Dublin Maker organising crew and thought it would be nice to make a few name plates. We started off with the this great instructable by Matthew Beckler. 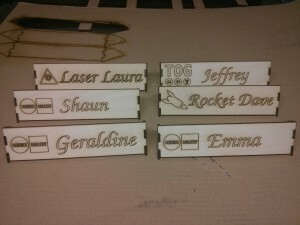 Taking about 2 minute per name plate to cut and then a bit of hot glue to keep them together. Check out our gallery for some more photos. This was written by tdr. Posted on Tuesday, May 26, 2015, at 9:19 am. Filed under Laser. Bookmark the permalink. Follow comments here with the RSS feed. Post a comment or leave a trackback.